We continue to work on place value and multiplication! This week we regrouped students based on their most recent classroom assessments. We are so excited to see how much growth students have made since the beginning of the year. Way to go! This week’s reading focus was comparing characters and diving deeper into setting. We read some amazing read alouds that helped us to explore both ideas. We will continue to practice comparing characters in small groups during book club sessions. Next week we will be continuing to compare books, but now, based on setting. Personal narratives are really shaping into some beautiful writing pieces! Both writing groups have moved into lesson on how to make their piece move from a story they are telling to a piece of writing they have crafted as authors. We are so excited to share them with you on Gallery Night! We continued to explore and research our counties! While completing the research, students learned about what phrases to use when using a search engine to get the best result, why it’s important to cite sources and how to evaluate information. Students also explored with coding in their first online project! Ask your child how they destined and animated their name. If you have internet access at home, they can even log in and show you! We are hoping to explore coding on a weekly basis, as our project schedule allows. If you have not scheduled a Fall conference already, please contact the office to do so. We are hosting Gallery Night/Spaghetti Night on November 13th. Please watch for tickets to come home later next week. K-2 families will once again be asked to bring in baked goods to add a sweet treat to the dinner! 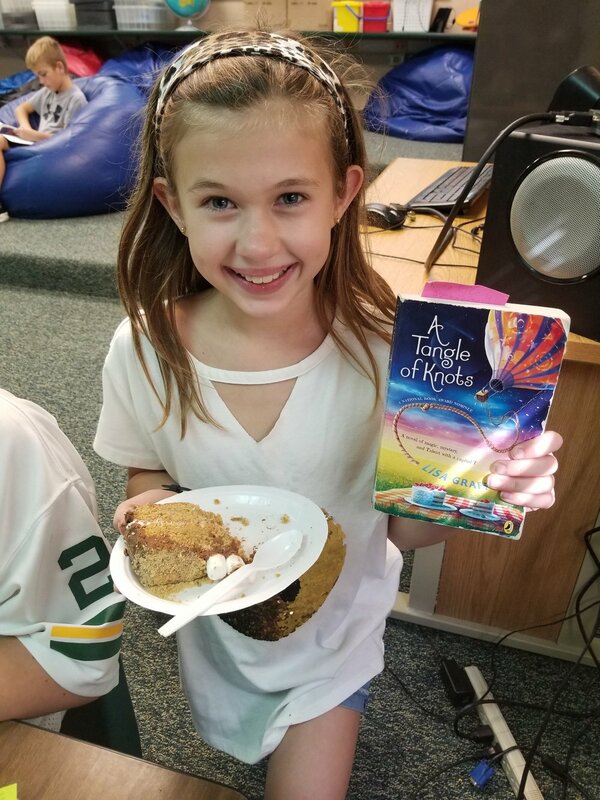 One of our book clubs, Tangle of Knots, had a surprise treat this week! One of our club members made one of the recipes in the book to share with us! How sweet! Math Workshop is giving us so many ways to practice our new math knowledge! The kids in these pictures are enjoying their technology station and mini-lessons.